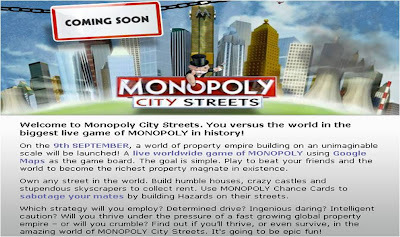 Players will be able to own any street in the world and build a whole range of new buildings to collect rent. (Rent is 'collected' automatically and streets are on a first come first served basis, though players will have the chance to buy streets from other people.) There will also be randomly assigned 'Chance' cards that will allow players to bring down the value of opponents properties by building prisons etc + even the chance to demolish opponents property! The game will be free to play and last for 4 months - great promotion for Monopoly and a nice way for Google to highlight their mapping and 3D building offerings. wow...as a child I would have never imagined this would be possible. Great, I think it’s a great idea. I always loved to play Monopoly when I was a kid and would love to try in online.